London, UK, Tuesday 10th February 2015: DP World London Gateway has announced plans to move forward with a third berth at the UK’s new deep-sea hub port, located 25 miles from central London. The Secretary of State for Transport, Patrick McLoughlin MP, visited the state-of-the-art port with local MPs. He climbed one of the world’s tallest quay cranes to view the location of the new berth which will increase deep-sea access for ships carrying UK imports and exports. The location of the DP World London Gateway Port, which has 16 million consumers within 50 miles, enables imports to enter the UK closer to where the goods will be consumed. Bringing ships closer to key areas of consumption such as London, Birmingham and Manchester, reduces the need to truck goods many miles inland, thereby removing unnecessary supply chain costs. In addition, rail services from the port now call at 11 destinations across the UK, offering a highly efficient alternative to road freight. The Berth Three announcement will enable the use of an additional 400 meters of quay length with a dredged depth of 17 meters alongside. DP World London Gateway port can easily handle the largest container ships and has developed innovative technology to ensure the port remains open in bad weather. Contracts have been awarded to VolkerFitzpatrick for civil and electrical works and four new quay cranes have been ordered from ZPMC. The third berth is planned to be operational in the second half of 2016. 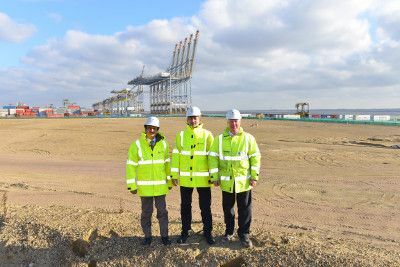 DP World London Gateway management showed the Transport Secretary the scale of the port as well as the adjacent London Gateway Logistics Park. 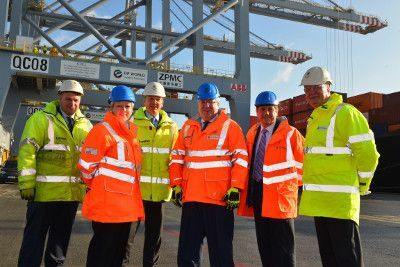 Secretary of State for Transport, Patrick McLoughlin MP, said: “The continued expansion of London Gateway Port proves Britain is a country where companies want to invest. “Having visited the port I have seen for myself what a fantastic piece of infrastructure it is and the opportunity that exists for even further growth and expansion at this site. He continued: “This is a very busy time for the team and I would like to praise them for their achievements. On Friday, last week, we welcomed the Global CEO for Prologis, Hamid R. Moghadam, and launched our 316,000 square foot joint venture distribution centre, which will be ready for occupation later this year. Maritime, the largest UK container haulage company, is now establishing a base at DP World London Gateway. Pentalver, the leading container solutions company, is also constructing a new facility which will open soon. DP World London Gateway, Engineering Director, Andrew Bowen, said: “Last week we saw our busiest day since operations began with both our existing berths simultaneously handling ultra-large container vessels, the Maersk Edinburgh and Hamburg Süd’s Cap San class, with strong performance ship-side and landside. Opened Q4 2013, DP World London Gateway is the UK’s first 21st Century major deep-sea container port and Europe’s largest logistics park. Owned and operated by DP World and situated on the north bank of the River Thames, London Gateway provides unrivalled deep-sea shipping access to the largest consumer markets in the UK. The port's location, with its superior operational systems and service, ensure ships load and unload as fast as possible, making London Gateway a world class asset for the UK. DP World has a portfolio of more than 65 marine terminals across six continents, including new developments underway in India, Africa, Europe and the Middle East. Container handling is the company’s core business and generates more than three quarters of its revenue. In 2013, DP World handled 55 million TEU (twenty-foot equivalent container units). With its committed pipeline of developments and expansions, capacity is expected to rise to more than 100 million TEU by 2020, in line with market demand.